I started back on the Paleo Diet about a eight days ago, although I have been eating the Paleo way for a lot longer, I have also been eating a lot of junk and drinking a lot of flavoured milk. So one very minute good thing is that I am quite used to eating Paleo when I actually cook, I try and stick to the Paleo Diet list of foods. The first week has been fine, went through the coffee and sugar withdrawal headaches, extreme lack of energy and general tiredness you get when you cut out all sugar and carbs. I am pushing on and each day is becoming easier, at least the headaches have gone, bonus! I've been eating lots of meat and veg, pork chops, rump steak, chicken and of course bacon, on the vegetable front I have been eating lots of kale, broccoli, carrots, brussel sprouts, cauliflower, spinach and mushrooms. Oh and eggs, lots of eggs. Fairly simple basic choices at the moment, no doubt boredom of eating the same things will encourage me to become a little more creative. For cooking I have been using my Barbecue, I only use the hot plate side, for frying meat and eggs, I steam all vegetables and always have a plate of veggies ready to be warmed up for meals, usually I eat one to two meals a day, since starting the Paleo Diet again I have been eating three decent sized meals a day. At the end of the week I am doing well and sticking to the diet, hopefully I can keep it up and reach my goal of losing thirty kilograms in six months! I am going to try my best, but I want feel to guilty if I fail, I have a feeling I can get back into it now, let's hope so! 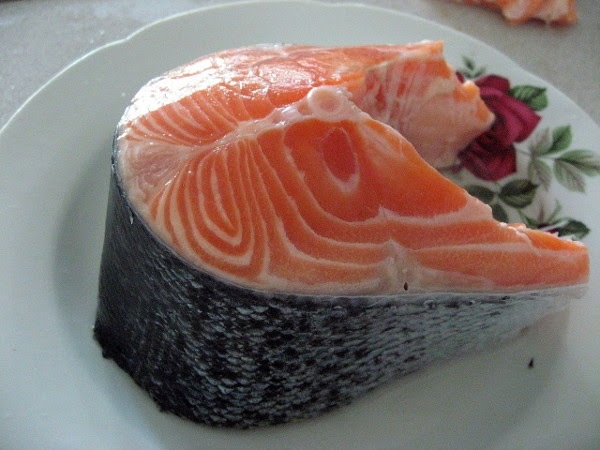 I try and eat a fair bit of salmon while on the Paleo Diet!